Hello, I’m Jack Dunigan of thepracticalleader.com. So standby for Showing Up, episode #1 in our series The Secrets to Success You Don’t Know That You Already Know. John was a great friend. He was highly successful. He built the Diablo Canyon nuclear power plant and developed geothermal power plants in Northern California. He was highly respected by his peers in the industry and by his associates everywhere else. But his success didn’t come from luck or chance, it didn’t happen by favoritism. He certainly wasn’t well born into an influential and powerful family. And John was just too nice of a guy and had to high of a commitment to integrity to ever engage in any political scheming. No, John made it because he accomplished things. He once told me it’s surprising how much you can do if you just do it. Now, accomplishment is, well, getting things done. It means finishing a job you’ve been given, completing an assignment that’s yours, solving a problem that you face, resolving an issue that blocks your way, and if you work for a company that makes its money by billing hours to clients, you produce billable hours. But before you can finish anything, you have to start something. It’s amazing how far you can go if you just show up. It’s just that simple and that easy, you just show up. Really, is that it? Is showing up really a success secret? Surprisingly and sadly this is less prevalent than we would hope. Like you I’ve worked with, and hired, and fired associates who seem to be incapable of showing up every day. For some reason they can’t be there. They’ve got to leave early, they’ve got to come late. And they seem to be perplexed why others get ahead financially, why others advance professionally, why others increase in stature and authority, when they don’t. They just don’t seem to get it. Showing up indicates that you take the job and its responsibilities seriously. It proves to others, particularly those that hire you, or if you work for yourself and you have your customers approve to others you’re reliable and trustworthy. It shows that you take yourself and your contribution to the company, to your company, seriously. It shows that you possess a desire to succeed and are willing to apply yourself to the task at hand, not procrastinate. And it absolutely demonstrates you’re building the habit of consistency that you’re just there when you need to be there. 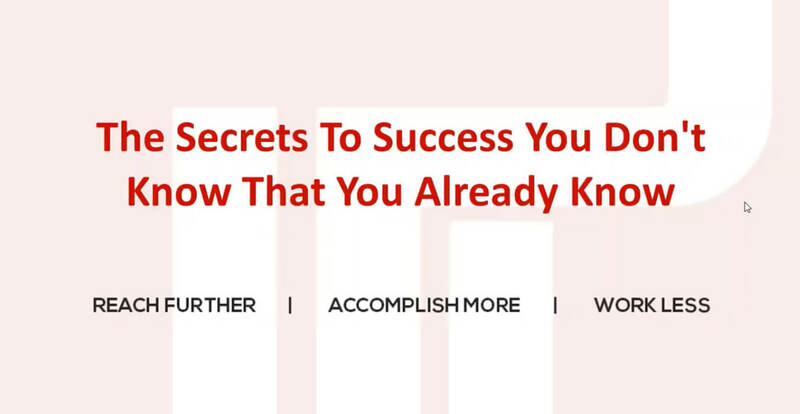 Success secret that you didn’t know that you already know, showing up. If you want to finish well, you must start well. It’s simple, it’s easy and it’s oh so effective.